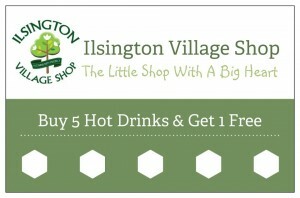 On Saturday we are launching a new shop loyalty card for customers using the cafe: Buy five hot drinks and get a sixth free! Emma will be handing out these new cards at the Community Market on Saturday 10 October at the Village Hall. Come along between 1pm and 4pm and collect a free stamp on the card to get you started as well as enjoying a traditional craft and local produce market.